Dal palak or palak dal must be one of the most popular comfort foods in India. Everyone has their own version of this dish. Hot rice and this dal make one of the most soothing and fulfilling combination. I have tried it many times with different dals like moong, chana, tuvardal or with combined dals. Every version I like it! and also tasted it. . 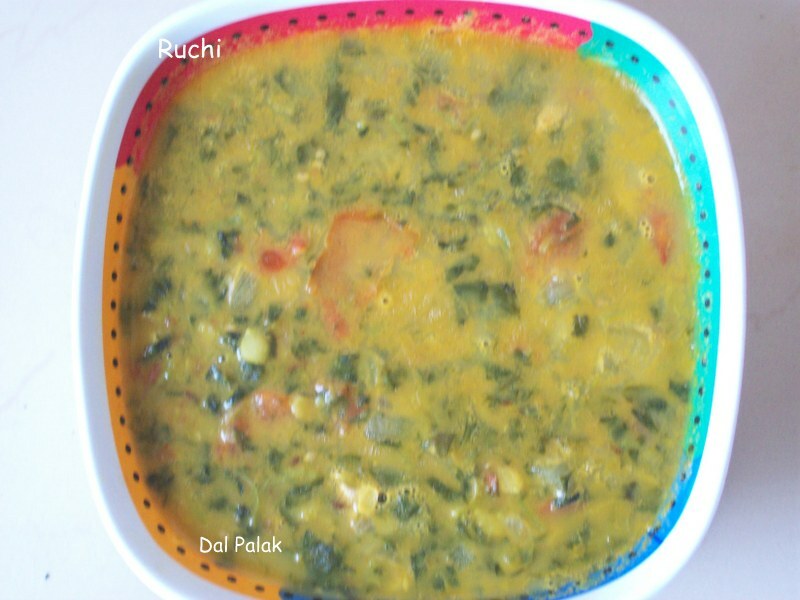 Both Dal and spinach are healthy, light, visually pleasing and nutritious. It can even be a side dish for lunch. 2 Heat oil in a heavy bottomed vessel, add cumin seeds and as they splutter, Add the chopped onions and ginger-green chilli paste and saute for 3-4 mts. 3 Add red chili Powder turmeric pwd, coriander pwd ,cumin pwd and garammasala powder combine and saute for 3-4min..
4.Add chopped tomato and saute for another 3min. Cook covered for 2-3 min till tender. Keep the flame low. 5.Add the cooked dal along with salt and half a cup of water and combine cooked palak cook uncovered till it gets mix well with the masala cook on low to medium flame till it get desired consistency.. Serve with rotis or Plain rice. Thnks RC sir for quick Response:) Yes this recipe is very healthy& Tasty!